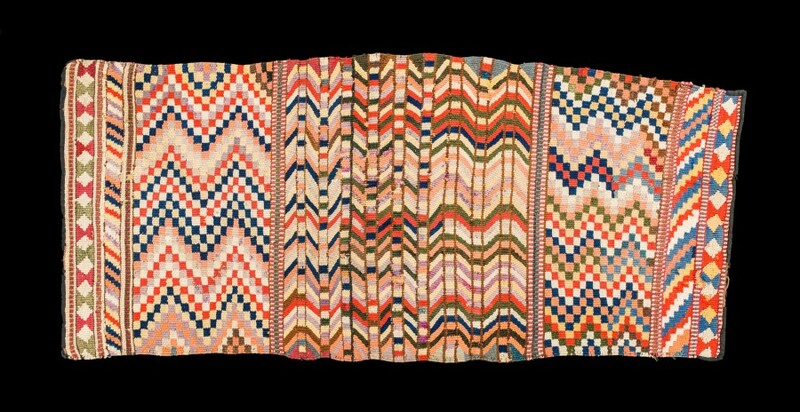 Charles F. Newcombe purchased this dazzling Coast Salish textile from the Tolmie family of Victoria. Dr William F. Tolmie, an employee of the Hudson’s Bay Company, may have collected it as early as 1852. Traditional twined and twill-woven Coast Salish textiles were made of mountain-goat wool mixed with plant fiber and hair from ‘wool dogs’ that were bred for that purpose, and coloured with plant and other natural dyes. When commercial wools and dyes became available, they were incorporated, as they were in this example that includes commercial yarns but possibly not mountain-goat wool and dog hair. This robe was probably made in the first half of the 19th century when bright colours and intricate patterns began to be used. The Royal BC Museum acquired it with the Newcombe estate in 1961.